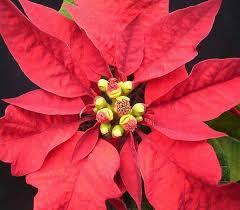 Today, December 12, is Poinsettia Day. That was the day on which Joel Roberts Poinsett, for whom this beautiful holiday plant is named, died in 1851. More about Mr. Poinsett below. Those gorgeous red flowers are not really flowers. Botanically speaking, the brilliantly colored petals are known as bracts, a kind of modified leaf. The actual flower is that small yellow knobby cluster down in the middle. Does it matter? Of course not. But it’s fun to know. You may have heard somewhere that poinsettias are poisonous. That’s mostly incorrect. A study at Ohio State University showed that a 50-pound child would have to eat more than 500 leaves to have any harmful effect. But she wouldn’t get anywhere near that, because they taste nasty. However, if you have puppies or kittens in the house, it’s probably a good idea to keep the poinsettia out of reach, just to be safe. The poinsettia plant is native to Central America, particularly Mexico, where it grows as a perennial shrub and easily reaches 10-15 feet tall. Montezuma, last of the Aztec kings, loved the plant so much he ordered they be shipped to his palace, in what now is Mexico City, by caravans because they couldn’t be grown in the high altitude. The poinsettia is named in honor of Joel Roberts Poinsett, a diplomat and amateur botanist of the early nineteenth century. I’ll give you a few highlights of his story. Poinsett was born into an upper middle class family in South Carolina, and was educated extensively in Euro pe. Significantly for our purposes, he studied medicine at the University of Edinburgh. Like many physicians of that era, he became intensely interested in botany as a way to explore the medicinal properties of native plants. Later, serving as the first US ambassador to Mexico, he came across a beautiful shrub with large red flowers growing wild, so he took cuttings from the plant and brought them back to his greenhouse in South Carolina. That in itself would be enough to earn Mr. Poinsett a place in our hearts. But there is more. After his time in the diplomatic corps, Poinsett was named Secretary of War in the cabinet of President Van Buren. 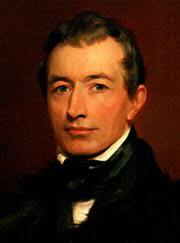 In that capacity, he supervised the United States Exploring Expedition (1838-1842), the first circumnavigation of the globe sponsored by the United States. He insisted that the expedition be staffed with scientists and that their mission was to collect geological, biological, and anthropological specimens throughout the trip. The artifacts collected on that expedition were brought back to Washington, D.C. and put on display at the Patent Office building. It was a calculated move, for Poinsett had a larger plan in mind. In 1840, Poinsett, the amateur scientist, co-founded an organization with the lofty name of the National Institute for the Promotion of Science and the Useful Arts. Its purpose, beyond the obvious, was to promote the notion of a national scientific museum, using the bequest of a British citizen named James Smithson. A wealthy bachelor, Smithson had left his fortune to a nephew and the nephew’s heirs, or if there were no heirs, to the United States in order “to found in Washington, under the name of the Smithsonian Institution, an establishment for the increase and diffusion of knowledge among men.” The nephew, childless, died in 1835, and so the donation passed to the US, prompting a fierce debate over how best to use this windfall. Poinsett was the first to argue that Smithson’s money should be used to create a national museum. And, in a nice bit of synchronicity, the Patent Office, which Poinsett used for the Exploring Exhibition display, now houses the Smithsonian’s American Art Museum and the National Portrait Gallery. Now, James Smithson’s own history is quite a story in itself. In fact, let’s try an experiment. If ten people write back and say they want to hear it, I’ll include that drama in a future newsletter. From the web page, use the yellow “Send Maggie a Message” box at the bottom of every page. Or from the newsletter, just “reply” like you would any email.